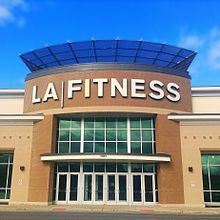 LA Fitness International LLC (doing business as LA Fitness) is an American gym chain with more than 700 clubs across the United States and Canada. The company was formed in 1984 and is based in Irvine, California. LA Fitness, previously Rainbow Nautilus was founded in 1983 by founders Chin Yi and Lisa Maria Novins. In 1984 Louis Welch, President & CEO partnered with Chinyol Yi changing the name of the corporation with one location at the corner of Hollenbeck Avenue and Arrow Highway in Covina, a suburb of Los Angeles, California. Official records describing the company's history and growth are few. Through the mid-1990s, the company expanded by acquiring under-performing fitness clubs in southern California, and by developing, opening and operating newly constructed properties. In 2007, the company expanded outside of the United States by acquiring six fitness clubs in Toronto, Ontario, Canada. In 2010, the company acquired ten locations in Phoenix from Pure Fitness Arizona. Within a year, all but one of the former Pure Fitness clubs were closed. In the 2009 Collier Township shooting, also referred to as the LA Fitness shooting because it took place in an LA Fitness health club in Collier Township, Allegheny County, Pennsylvania, four people were killed. On November 30, 2011, the company completed the acquisition of 171 clubs, for $153M, from Bally Total Fitness. LA Fitness then began closing some former Bally Fitness clubs near existing LA Fitness facilities and remodeling others. On July 2, 2012, the company completed the acquisition of all 33 Lifestyle Family Fitness Clubs in Florida. According to Lifestyle CEO, Stuart Lasher, "we evaluated our option to remain an independent company or to sell to a larger organization. After careful consideration, the board of directors has made the decision to sell all of the Lifestyle Family Fitness clubs in Florida to LA Fitness." On December 23, 2013, LA Fitness announced the acquisition of The Buffalo and Rochester Athletic Clubs in western New York. On December 30, 2013, they completed the acquisition of all 10 Vision Quest Sport and Fitness clubs in the greater Seattle area. ^ "LA Fitness History". Corporate Offices & Headquarters. Retrieved May 28, 2015. ^ "LA Fitness acquires Pure Fitness gyms". azcentral.com. ^ "Pennsylvania gym shooter described as quiet, studious". CNN. August 7, 2009. Archived from the original on April 5, 2010. Retrieved April 23, 2010. ^ Quinn, Dale (November 29, 2011). "LA Fitness buys Bally's locations in Tucson, elsewhere". Azstarnet.com. Retrieved January 4, 2014. ^ "LA Fitness brings changes to Ballys". Daily Breeze. ^ "Lifestyle Family Fitness chain is sold". Herald Tribune. June 19, 2012. Retrieved May 1, 2014. ^ "Buffalo/Rochester Athletic Clubs Acquired by LA Fitness". www.lafitness.com. ^ Stuarty, Goldman (December 30, 2013). "LA Fitness Acquires Seattle's Vision Quest Sport and Fitness Clubs". clubindustry.com. Retrieved May 1, 2014. Wikimedia Commons has media related to LA Fitness. This page was last edited on 11 March 2019, at 01:33 (UTC).